There’s an increasing interest among libraries in the the concept of managing their service portfolios. For good reason. We all know that libraries and information organizations are service organizations that like nothing better than adding services, enhancing services, and customizing services. But suggest that some services be phased out or eliminated to make room for new services and there’s this eerie silence…..these sideways glances…..a few sighs….and a lot of resistance. It doesn’t seem to matter how burned out staff are, many libraries just find it incredibly difficult to stop certain services. Yet the reality is that a library’s service portfolio is its very lifeblood. An over-stuffed portfolio of too many services is confusing for customers and draining for staff, processes and resources. Imagine a garden that’s never weeded or pruned —- it’s impossible for new plants to take hold or be seen, and even the strongest plants are eventually choked. For libraries to keep their service offerings fresh, relevant and innovative, they have to manage the lifecycle of their services: new services eventually mature and need to either be revamped or divested. Yes, divested — ceased — stopped. So, how should libraries decide what services need to be started? continued? stopped? By committing to manage their portfolio of services. That is, all the services they offer to balance risk (usually the new services) and value. Emotional: library staff really enjoy offering the service – or some staff worked hard to develop the service in the first place – or staff are fearful their jobs are tied to the service, etc. Whatever reason is driving the reluctance, the discussion regarding what services the library is offering now – and what services the library SHOULD be offering should happen, and it should happen regularly. As difficult as that discussion is, it is one of the most important discussions in which management and staff should engage. The library IS its services, and a reflective, wide-ranging dialogue about the health of its full range of services is vital for the library’s success. 1. Review strategic goals: start where every conversation about services should start, by looking ahead to where the library is headed. What are the library’s goals during the next 12 – 24 – 36 months? How will it positively impact its clients’ (be they patrons, students, faculty, or corporate employees) lives? 2. Study target groups: what client groups is the library focusing on? 3. Inventory offerings: what are the library’s current services? Sometimes this is one of the liveliest discussions, since many staff label the same services differently. This conversation may be the first opportunity for staff to view all of the services through the same lens. 4. Assess the strategic fit & client interest of each offering: so….how does each of those services support the library’s strategic goals, or the goals of the client groups? and…..how do the clients view each of the services? which of the services do the clients value most? Cuz they don’t value all services equally — they just don’t. 5. Assess the organizational capabilities of each offering: how well does the library develop and delivery each of the services? what’s the investment for each services? are there a few services pulling a lot of resources? and does this investment make sense? 6. 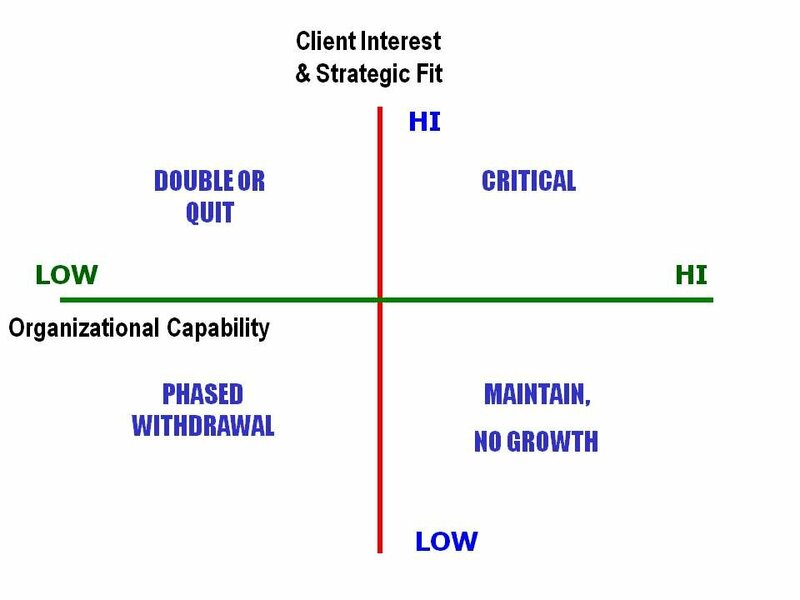 Map the offerings: using a simple grid, like the one shown here, use post-its or “dots” to DRAFT where each of the current offerings fits within a portfolio matrix. This grid is based on Boston Consulting Group’s famous market share/market growth matrix as well as work by Robert Cooper on product portfolio management. It’s just offered here as a way to have a holistic view of a library’s services. – What services are does the library have the capability to develop and deliver AND have high client interest as well as high strategic fit? Those are the CRITICAL services – for now. – And, which services have high client interest and strategic fit, but aren’t as easy for the library to deliver? A decision has to be made about those……will the library increase its investment to improve development & delivery? or get out of the service? DOUBLE OR QUIT? – Those services in which clients aren’t as interested and which aren’t strategically important for the library fall below the middle line; these services can either be maintained with no further investment of development (MAINTAIN,NO GROWTH), or phased out altogether (PHASED WITHDRAWAL). 7. Discuss, debate, decide: Just drafting this portfolio grid initiates much discussion, and begins to identify what new services are necessary, and to make how room to grow these new services. The first 6 steps listed may sound daunting, but don’t let the steps become more work than is necessary. If your library hasn’t looked at its full service offerings in a while, don’t get bogged down in the details. It’s much more important to start with what you do have and what you do know, to draft a portfolio grid — even if it’s incomplete or “iffy” — and see where more information is needed. Portfolio management takes time, and over time you will become more comfortable and more proficient at working through it. But for right now, do what all good gardeners do to get their garden in shape: step back, have a look at what’s doing well and what’s needed, what’s not doing well, and weed out some stragglers to make room for new growth. ← Checklist Manifesto for Information Professionals?